New Delhi – In a bid to boost clean technology development in India, the Federation of Indian Chambers of Commerce and Industry (FICCI) has proposed a 10-point agenda. 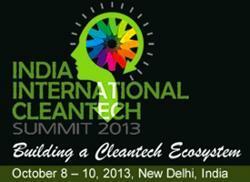 The strategy was spelt out by Ms. Naina Lal Kidwai, President, FICCI, at FICCI’s India International Cleantech Summit 2013 currently under way. Clean technology needs to be given a push through appropriate set of incentives and policy prescriptions, since early stages of clean technology revolution would need government hand-holding to make the shift to clean technology adoption a cost effective proposition. There is a need to ensure a long term sustainable action plan for clean technology development and implementation for the country. And must ensure that the base for developing these technologies within the country is established and a strong supply chain for the future is created. For encouraging production of raw material for different Cleantech segments, schemes for low interest rates and long term loans should be introduced. Technology upgradation schemes for existing technologies and viability gap funding for new clean technologies should be extended. There is a need for policy support for incentivizing R&D in clean technology as this will provide the basis for cost reduction in the long term. The government should promote cluster R&D for different clean energy technologies to improve efficiency and local development. Short to medium term research and development projects with industry partners should be promoted. This will provide flawless transfer of technology from lab to commercial scale. While certain capacities should be developed through promotion of local manufacturing, there will be specific technology components which will have to be imported in near future, as developing capacities would take some time. Tax and duty rationalization of these components should be given priority. FICCI released a Report in August on Securing the Supply Chain for Solar Energy which details recommendations specifically for solar PV and solar thermal supply chains. Similar needs will have to be looked into other clean technology segments. Integrated Cleantech Manufacturing Hubs will create a cohesive ecosystem for related manufacturing encompassing all elements of the technology value chain, supported by complete infrastructure availability such as availability of reliable and quality power, transport connectivity, waste treatment facilities etc. This will support in creating a secure supply chain and also optimize the costs by ensuring common utilities and economies of scale. There is a strong case for centralized development of clean energy and clean technology and an equally strong case for decentralized applications that need to be promoted as India is a diverse country with different levels of development, energy access, public utilities and public infrastructure. Also, there is a need for different solutions for different geographies within the country. And there is a place for all players to co-exist. The international community can play a big role in India’s clean technology pathway by providing the experience of innovative financing mechanisms and policy frameworks that have made clean technology an attractive investment option in other countries. The expertise of other countries is needed to build the ecosystem in India. FICCI believes that global companies can have a large role in the Indian clean technology space. Their role should be to build India’s capability to develop clean technologies, to be part of India’s sustainable growth story. Finally and most importantly, the industry needs long term policy signal to make the desired investments in clean technologies.